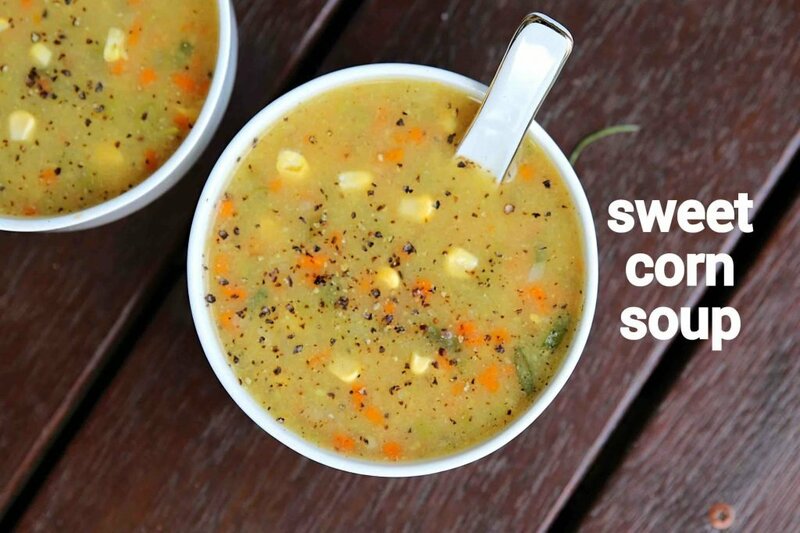 sweet corn soup recipe | sweet corn veg soup | chinese sweet corn soup with detailed photo and video recipe. easy and healthy creamy soup recipe made with sweet corn kernels and indo chinese sauces. it is a great party starter or party appetizer recipe and can be served just before the meals. 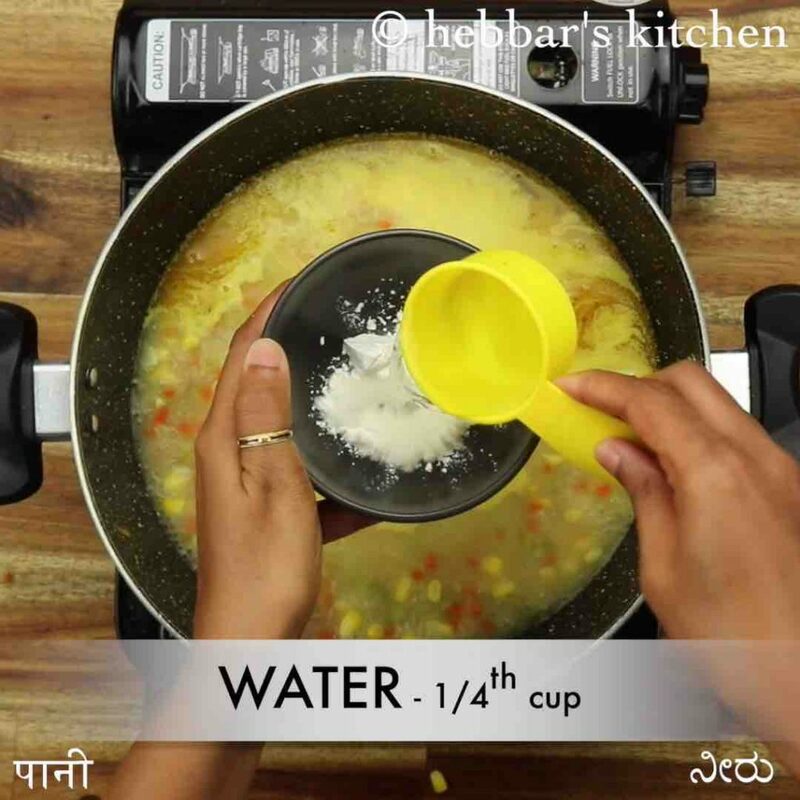 it is simple and easy to make soup recipe and can be made with basic ingredients available in most of the indian kitchens. 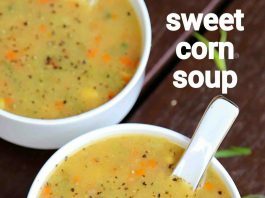 sweet corn soup recipe | sweet corn veg soup | chinese sweet corn soup with step by step photo and video recipe. 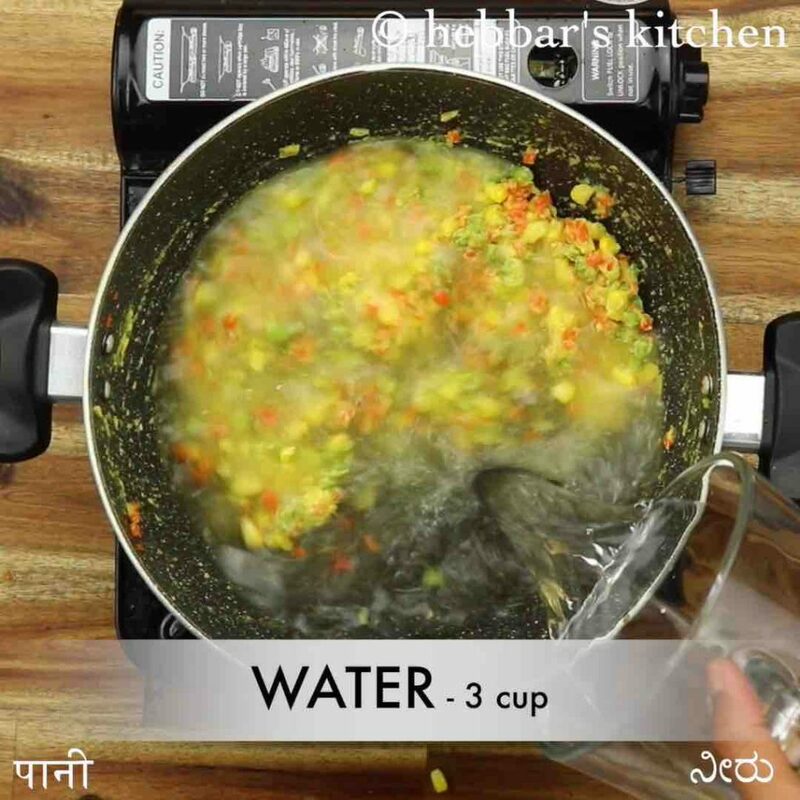 soup recipes are non-native dish to the indian cuisine. it was introduced lately and has gathered a lot of interests and appreciations with many indian households. particularly the indo chinese soup recipes have become default starters for any meal. one such soup recipe is sweet corn soup recipe made with corn kernels. 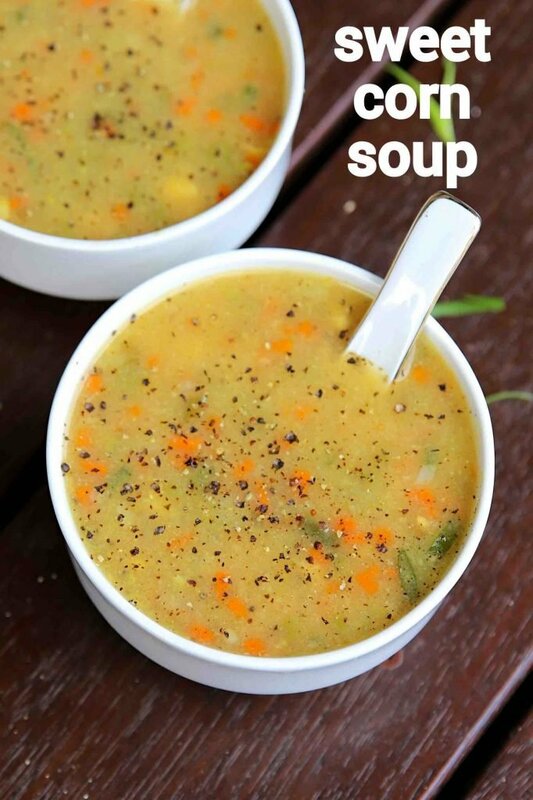 i have always been a huge fan of soup recipes and i try to include in my day to day meals. while i am not particular for any soup categories and i like most of the vegetable-based soups. having said that i have a specific interest to sweet corn soup as it is simple to make, yet delivers the required nutrients to make it perfect balanced meal. moreover the combination of sweetness, sourness and the spiciness make it an great meal starter. in addition there are quite a few variations to this recipe. i have tried to make it a thick by grounding few of corn kernels and added back to soup broth while boiling. some may prefer to have a lite version and same can be done by skipping the grounding step. furthermore, some important and critical tips, suggestions and variations to sweet corn soup recipe. firstly, i personally recommend using fresh sweet corn kernels for this soup recipe. i would only recommended to use frozen sweet corns only if you do not have access to the fresh one. secondly, the soup is always served warm or hot and should not be served chilled. if you are serving it later, ensure to warm it by either microwave or even re-boiling. 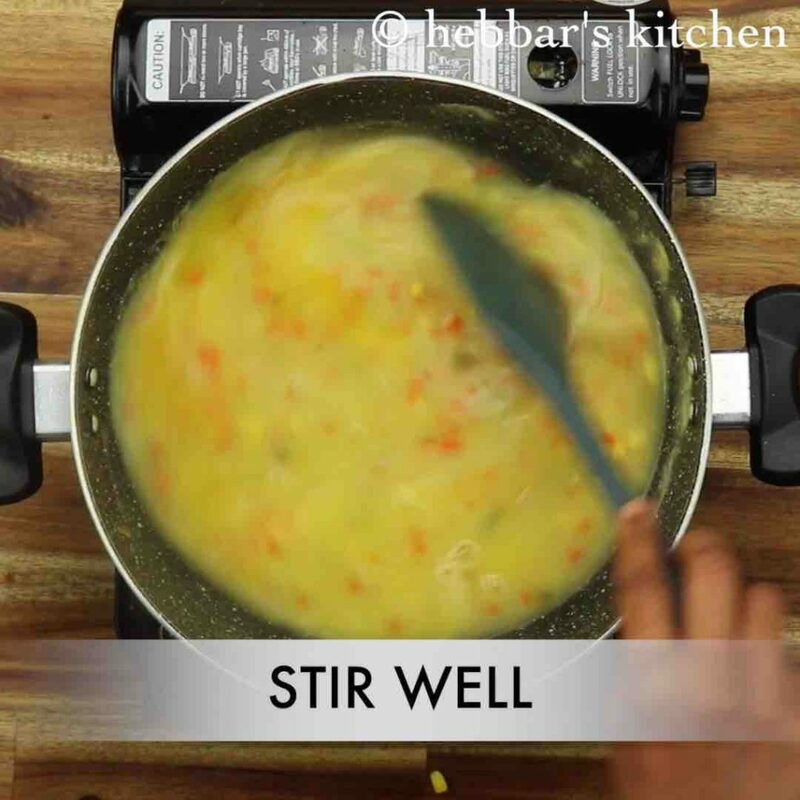 lastly, if you are comfortable with meat, you can use non-veg stock, particularly chicken stock. you even get the cubes for the same in supermarkets. 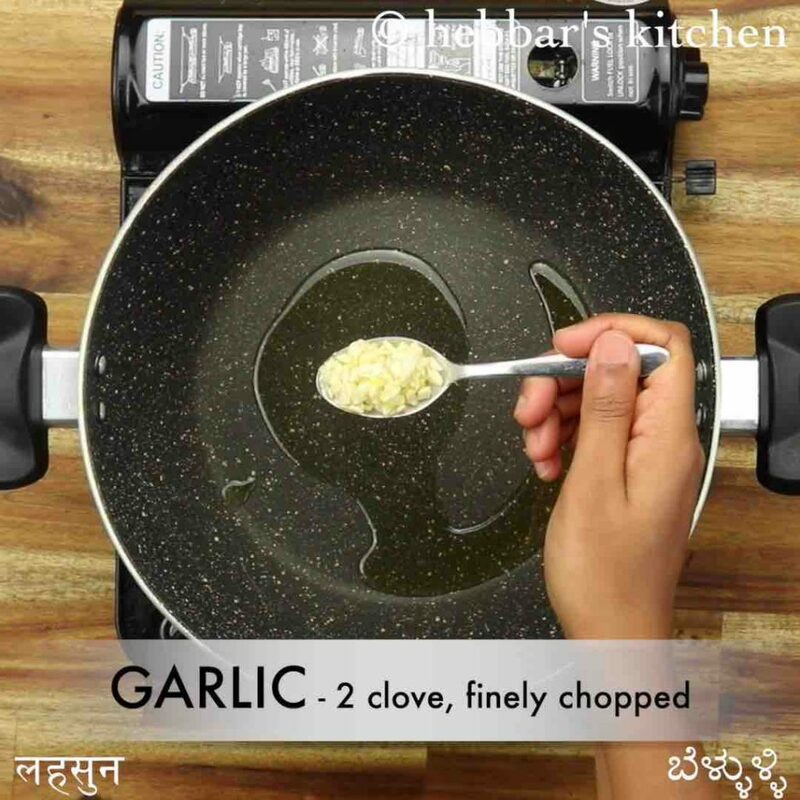 firstly, in a large kadai heat 3 tsp olive oil and saute 2 clove garlic, 1 inch ginger. 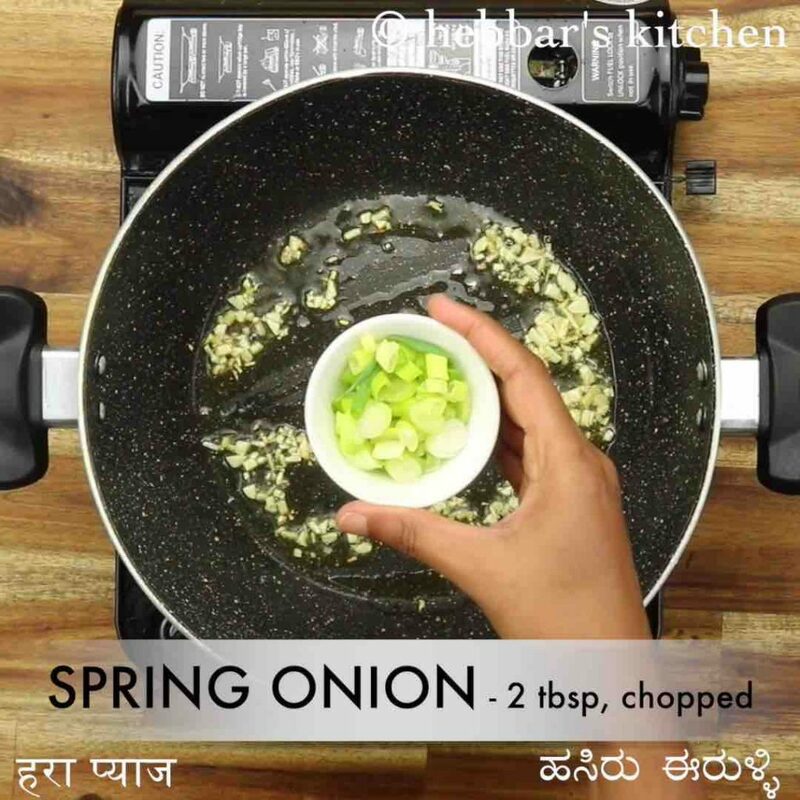 also, saute 2 tbsp spring onion slightly. 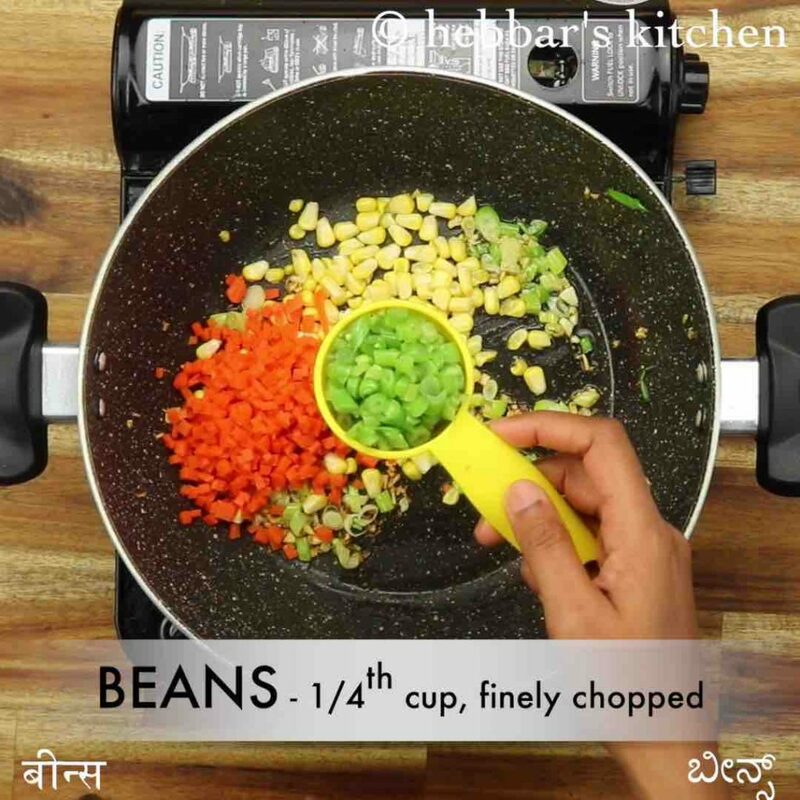 now add ¼ cup sweet corn, ¼ cup carrot and ¼ cup beans. 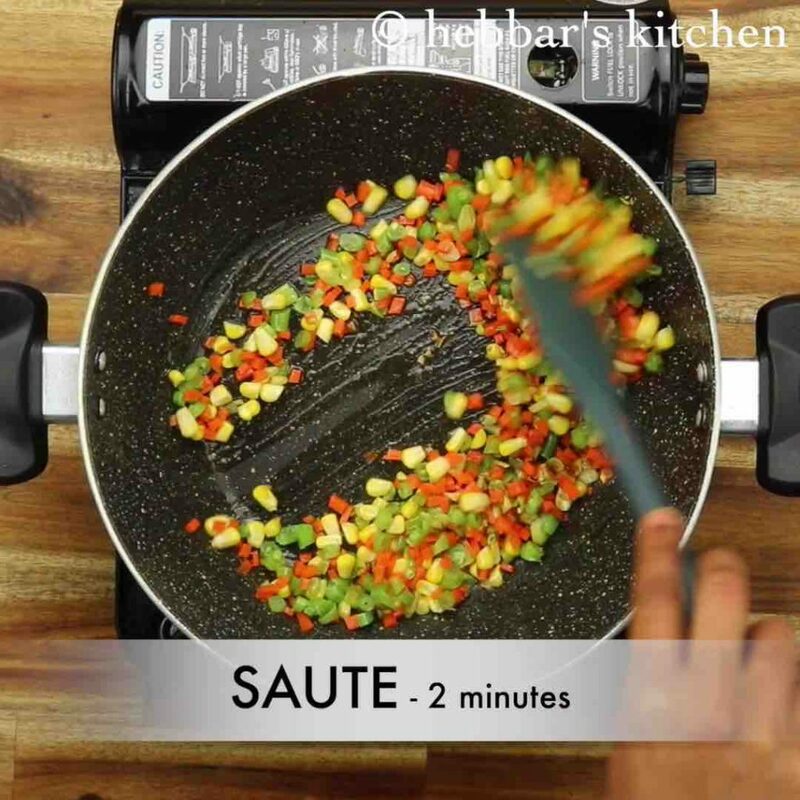 saute for 2 minutes or until vegetables are slightly cooked. 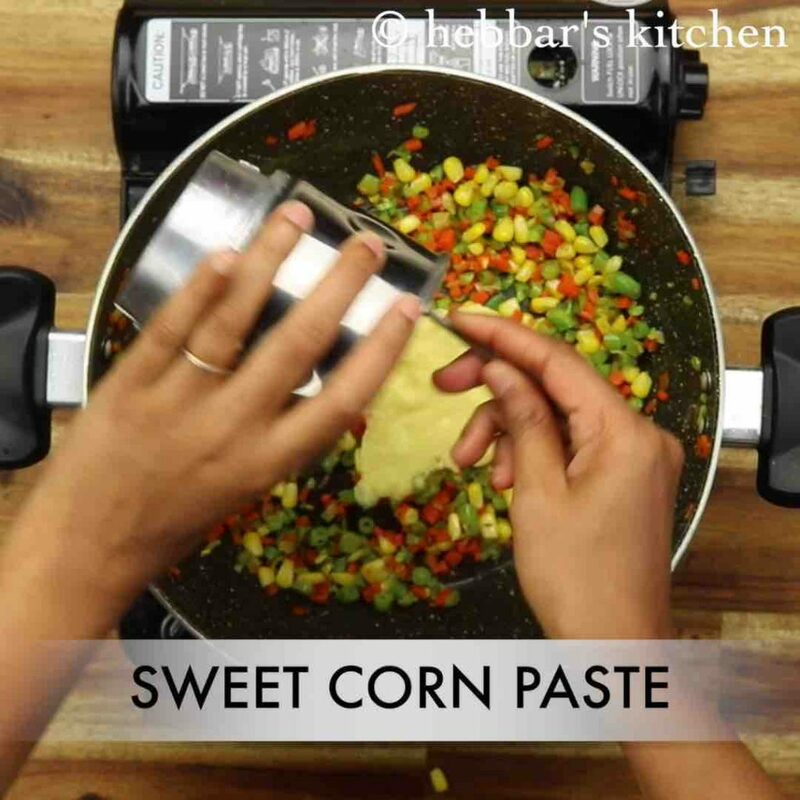 transfer the sweet corn paste and saute for 2 minutes. further add 3 cup water, ¾ tsp salt and stir well. 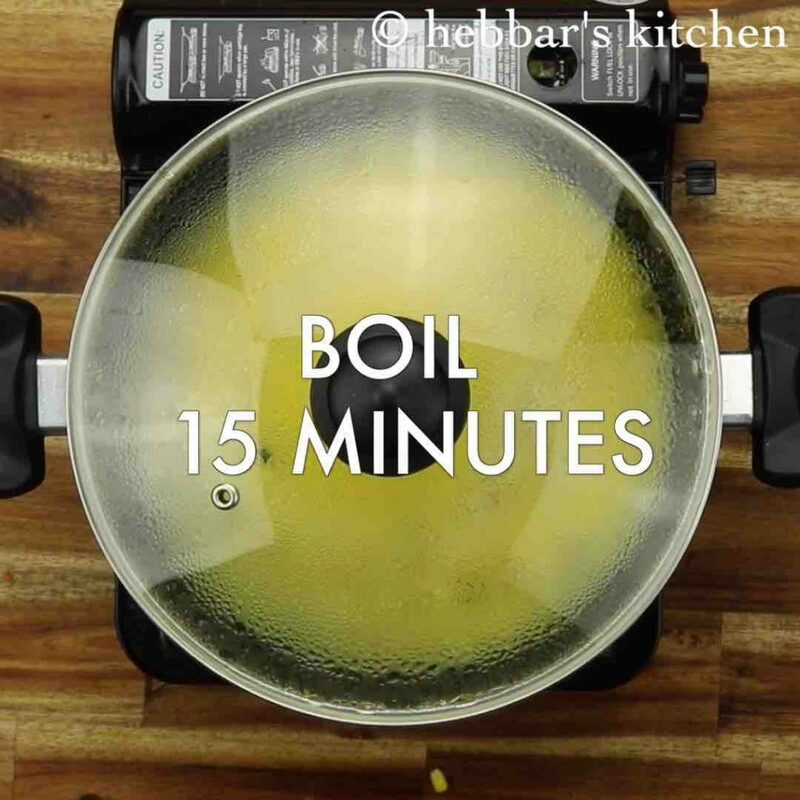 cover and boil for 15 minutes or until the vegetables are well cooked. 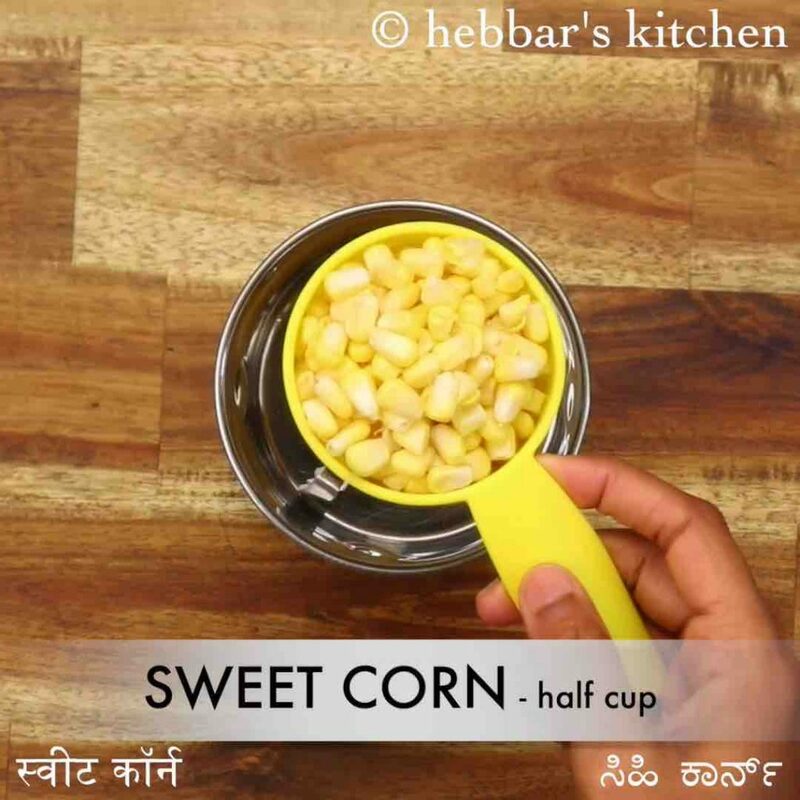 now prepare a corn flour slurry by mixing 1 tsp corn flour in ¼ cup water. mix to a lump free mixture. pour the corn flour slurry and stir well. stir and boil until the soup thickens. now add ¾ tsp pepper, 2 tsp vinegar and 2 tbsp spring onion. finally, enjoy sweet corn soup garnished with spring onions. 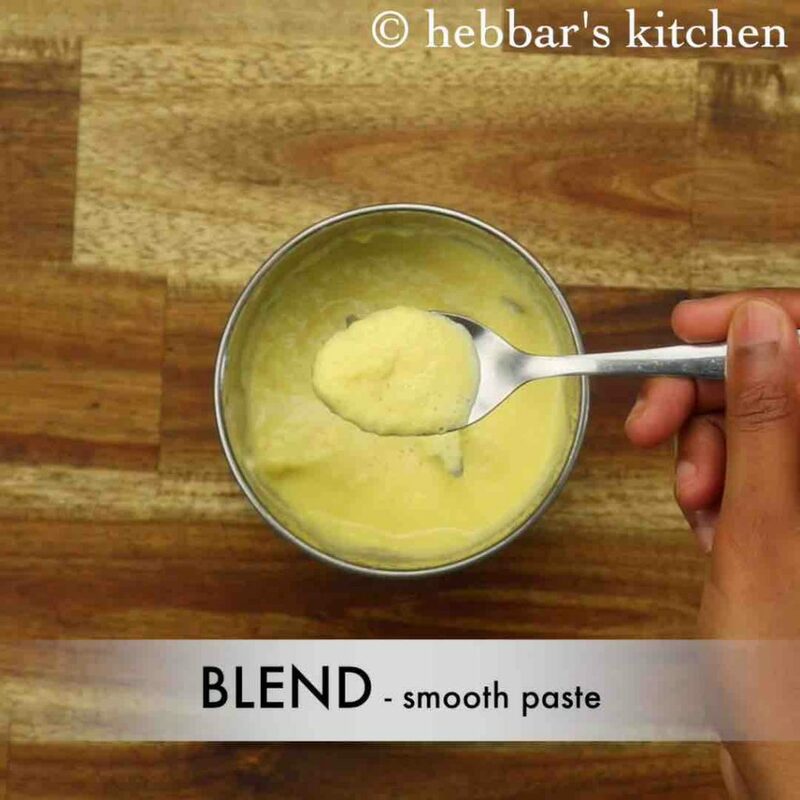 now prepare sweet corn paste by taking ½ cup sweet corn in a blender with 2 tbsp water. 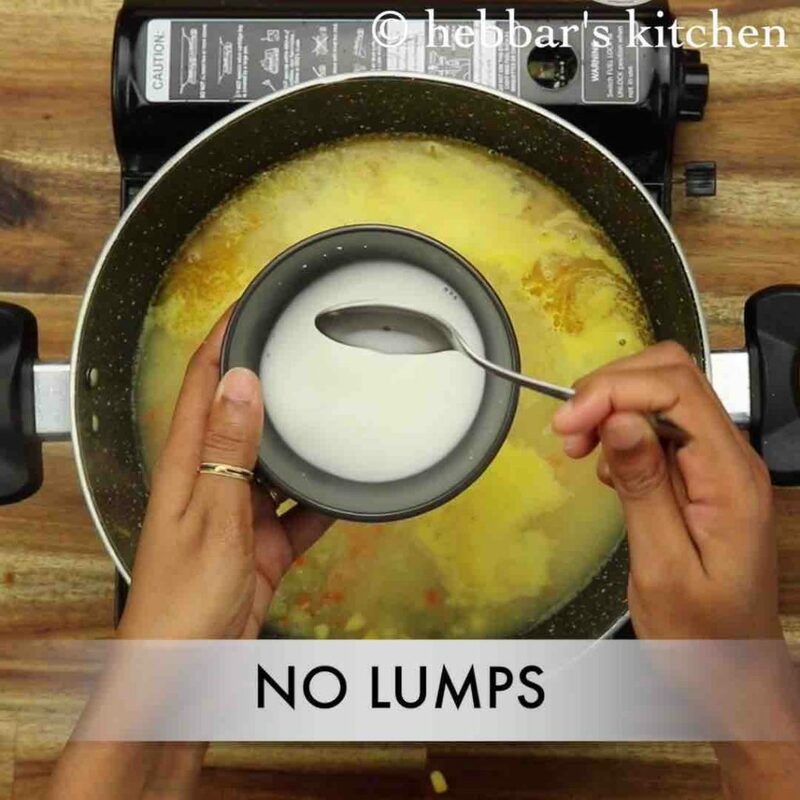 mix to a lump-free mixture. pour the corn flour slurry and stir well. now add ¾ tsp pepper, 1 tsp vinegar and 2 tbsp spring onion. firstly, add vegetables of your choice to make the soup more healthy and nutritious. also, to make it sweeter, add a tsp of sugar. my sweet corns were too sweet so i skipped it. furthermore, add corn flour paste checking the consistency. finally, instead of making sweet corn paste you can use canned creamed corn to make sweet corn soup recipe tastier.